← This Weeks Stash!! Postcards I received! The American Flag… As I See It! I am in a swap where we have to use our sewing machines that have all the neat stitches on it to make the card. I thought and thought and could not come up with anything. Then it hit me. American Flag. I was going to sew star embroidery on the left side and then for the stripes do the different stitches out of red, white and blue thread. 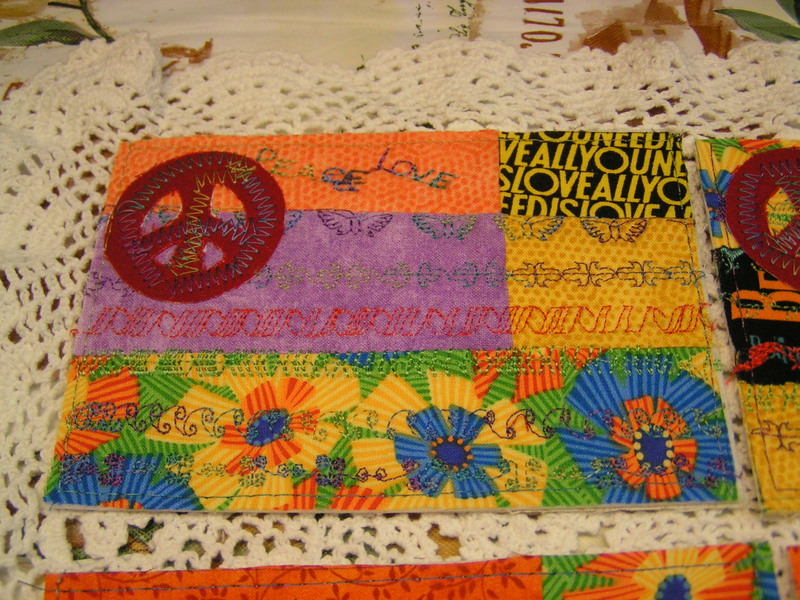 When it was time to do that I already was out of the mood so I thought that I could take scraps that I had sewn together and cut out the card. Put my star in the left hand corner and then do all the different stitches and writing on the card. This is what I came up with. PEACE AND LOVE! You can take the girl out of the hippy environment but you cant take the hippie out of the girl! 60’s rock! 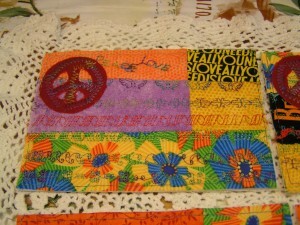 Peace and love postcard. Click on for better view!